This page introduces the ‘case discussion model’ in more detail and suggests approaches to using it in practice when planning contact for a child during care proceedings. This section provides practical resources for practitioners on how the case discussion model can be used. The aim of this model is to guide practitioners through the process of making contact plans for adopted children. The principles underpinning the model are that contact should be purposeful (how contact can benefit the child is the central question); individualised (taking account of the particular needs of the child, and of the particular qualities of children, adoptive parent and birth relatives that can have a bearing on contact), and that contact is a relationship‐based process that is dynamic across time. Throughout the stages described, it is important to involve in some way all relevant parties (the adoptive parents, the adopted child where old enough, the birth relatives). This model can also be used to review existing arrangements and to reflect on contact for children in long term foster care and in kinship care. Contact plans need to be case sensitive and based on the individual needs of particular children, their birth relatives and adopters. Social workers need time to think and talk about this in order to make the best plans for children, thinking about a child’s long term needs as well as their immediate needs after placement. This exercise is suitable for: individual learning; discussions in team meetings, supervision, to support contact planning for children and in training for social workers, foster carers, kinship carers and adopters. The case discussion model aims to support workers to reflect on the needs of individual children and the characteristics of birth relatives and adopters when they make contact plans. You can see this model in practice in our film clip. This shows a group of practitioners discussing a child called Jack. You can find out more about the background to this case by reading the Jack case study. You can find out more about how the model works by watching the clip of Beth Neil explaining the process. Once you have understood the process, you need to choose a child to discuss. This could be a child that you are working with, or you could use the Ava and Rory case study on this website. If you are doing this exercise as a group, one person needs to lead the group whilst another presents the case. It is not this person’s role to answer all the questions, the group as a whole needs to take time to reflect on the child’s needs without jumping ahead to solutions. The aim is to develop a contact plan that meets the specific needs of this child both now and as they group up, with plenty of opportunities for review. The child’s needs. How do you see this child’s needs both now, and across their lifetime, in relation to understanding who they are and whey there were adopted? Contact plan. If you were dealing with this child’s case, what kind of contact arrangements, if any, would you think of making when they move to their adoptive family? Purpose of contact. What would you see as being the purpose/s of the arrangements proposed in your plan? 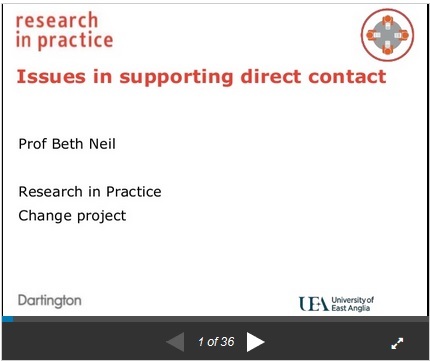 What might the benefits and challenges of contact be for all those involved? Management/support of contact. What management and support issues would you think may arise and how could these be addressed? A group of practitioners discuss the needs and contact plans of a child, Jack. This is an example of the case discussion model, reviewing support needs, risk mitigation and benefits of contact for both adoptive and birth family, in the long and short term, to develop an individual contact plan. Download the slides Issues in supporting direct contact (457kB) Powerpoint .PPTX file Slide presentation. 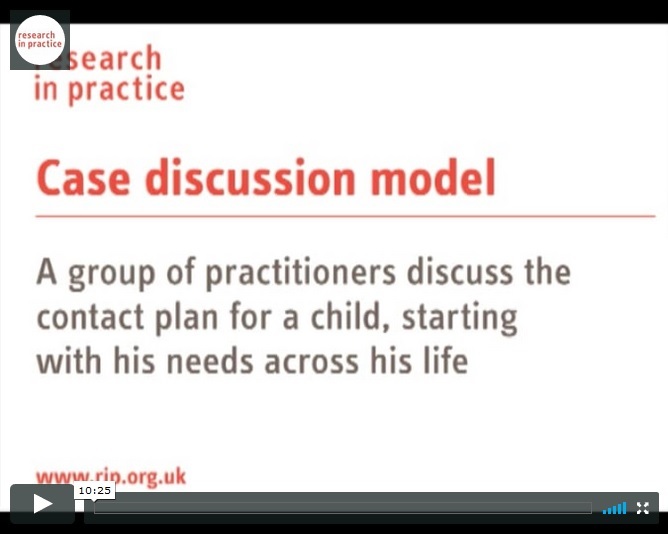 In this film Beth Neil discusses various aspects of the case discussion model, including the rationale behind developing the model, placing the child at the center of decision making and setting a meeting between practitioners to discuss planning.